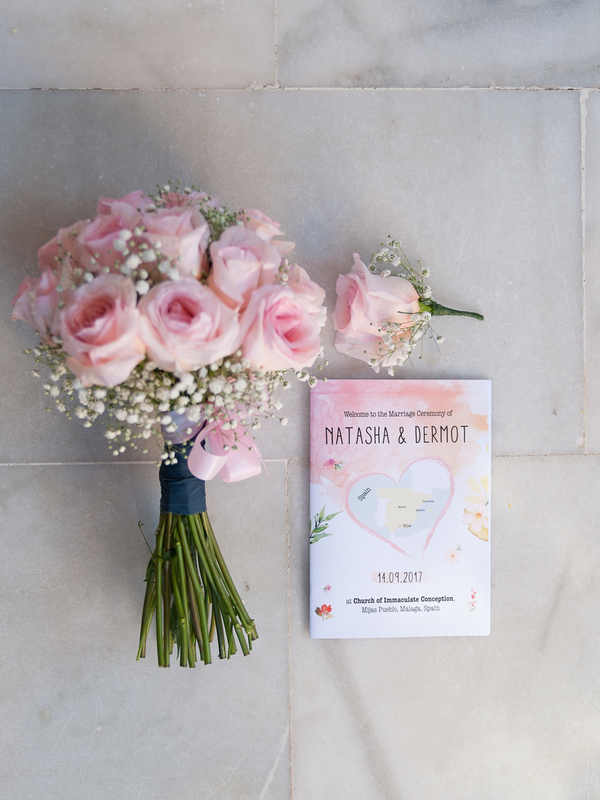 Natasha and Dermot enjoyed a sensational perfect wedding in Mijas Spain which was a mixture of a rustic church wedding in the hills of Mijas mixed with glam modern affair at an stylish chic beach club location. In the words of Natasha we share her story. In February 2016 Dermot treated me to a weekend to Krakow, Poland and one morning he persuaded me to take a horse and carriage ride during which he popped the question. With the excitement of the diamond and the laughter I forgot to answer – not that he needed one! After deciding to tie the knot in Spain we arranged a short trip to meet our wedding planners, Sunshine Weddings and view potential venues. They took us to see two chapels – one which we fell in love with. The Church of the Immaculate Conception was everything that we had imagined and hoped for. This was followed by a viewing of Ocean Beach hotel in Mijas. I remember on our way in I pulled Dermot back and told him to remember it wouldn’t look as good as it did in the photos. I was wrong! It was even more beautiful in reality. Soon after deciding the wedding would take place abroad we made the decision to employ the services of a wedding planner. This would make life easier, considering that we were both working full-time and had a toddler to care for. From the first email Sunshine Weddings completely understood what we were after and no question was too silly and the responses were so quick and friendly. With a few changes days before the wedding, including three guests not able to make it, the team handled all the issues with ease. As a bride I can safely say that the reassurance and help they provided on the day of our wedding is something for which I will never be able to thank them enough. When shopping for my wedding dress I brought along my auntie and mum as I knew they would give me an honest opinion on what suited me best. In I went to the shop knowing exactly what I wanted with a photo of the dress I was after. Eleven dresses later I soon realised the style I was after was not the style for me! I remember going home that evening and feeling nervous yet excited that I had just purchased the most important dress in my life. For the bridesmaids, I wanted a light fabric and, of course, their dresses to be of a similar style to mine, with the back being the main attraction. I ordered one of their dresses on a whim and although I loved it, I felt there was something missing. I took the gowns to the local dressmaker who added fabric to the front and instantly changed the dresses, making them feel more personal to me. Regarding the men, styling them was the most difficult task. From the start I knew that suits or even blazers were a no-go due to the heat. After many possible outfit ideas we settled on blue chinos to match the bridesmaids, linen ivory shirts and navy plimsolls. With the men it was definitely a case of ‘less is more’ and they looked great on the day of the wedding, along with their buttonholes to match the bouquets. Outside the chapel we had a small bay tree and a sign that Shona, our florist, made for our son to hold, welcoming our guests to his mummy and daddy’s wedding. With my bridesmaids’ dresses being blue we decided a pale pink would complement beautifully. I wanted the whole wedding to look relaxed and effortless, so we decided on a rose bouquet for myself and just a plain gyp bouquet for the bridesmaids. Although we chose a destination wedding it was very important that we married in a chapel just like a wedding at home and that my family friend, Fr. Thomas McHugh conducted the wedding. Although the chapel was quite large the mass itself was very intimate and personal to us – just how we wanted it. Father Thomas made the ceremony flow with ease while also making it humorous and meaningful. From the moment we got engaged I knew I wanted the music at my wedding to be just a man and his guitar and this is exactly what we had. One night Dermot contacted a friend and asked if he would be interested in coming out to Mijas with us and performing the music at our wedding and he instantly agreed. At the champagne reception Paddy sang along with his guitar while my daddy joined him with his Djembe drum (he is currently a drummer in a band). I remember sitting that day looking around the wedding reception while the two of them played side by side and thinking there was no feeling like it.